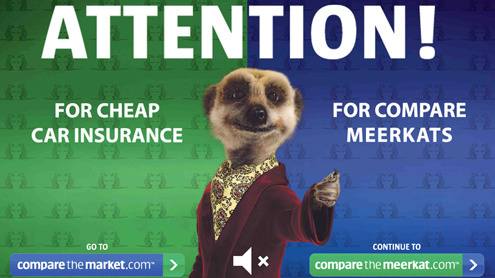 Compare the Market the company was founded by The BGL Group (insurance companies) in 2005 as a ‘Price Comparison Website’ while Compare the Meerkat is an advertising campaign for this brand. The campaign was launched January 2009 and is still running as of July 2014, centred around a CGI anthropomorphic Russian meerkat called Alexander Orlov, plus his family and friends. The idea of choice that is represented in the advertising is mythical – many companies on CTM are part of BGL group (synergy) with key competition being GoCompare (USP - Gio Compario) and Confused.com. The USP and ESP of the Compare the Market advertising campaign is Alexandr Orlov with Orlov voiced by actor Simon Greenhall who plays Michael from Alan Partridge. Catchphrase and taglines are important in advertising and Orlov’s catchprase is “Simples?. The characters were designed by Darren Walsh from Passion Pictures, who also directs all of the commercials. Passion Pictures are a west London film and animation company (visuals – Gorillaz) with Darren Walsh himself a critically acclaimed writer/director using stop frame animation and CGI. In his early career he worked at Aardman Animations (Angry Kid) but now works almost exclusively in advertising. Walsh’s clients include: Peperami, Specsavers, BBC iPlayer, Duracell, National Express Trains and the Sony Bravia ‘Play-Doh’ commercial (live action animation only – the narrative involves plasticine rabbits taking over New York).